That's because 85% of consumers order wine by-the-glass and bottles are inefficient - particularly at volume. More premium wines by the glass, reduced environmental impact, the consistent taste and temperature, ease of service and more. So that's all we do. 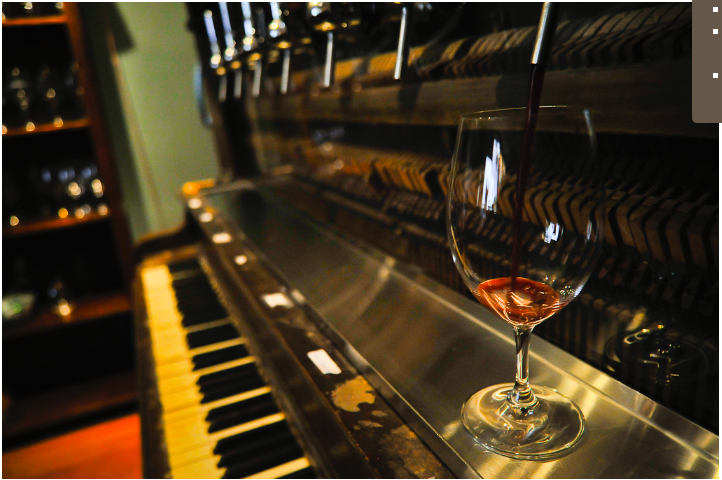 We offer the broadest selection of exceptional wines on tap in the Mid-Atlantic. And we our wines are distributed through a network of partners other states. We know what works and what doesn't. Equipment, marketing and service. Ask us how. As the only importer and wholesaler exclusively distributing wines on tap we love to educate consumers and businesses alike. Don't hesitate to contact us if you simply looking for a good source of information. Wine on tap also guarantees every glass will be fresh to the last drop and it consumes less production, packaging, and transportation costs. The winemaker and Tap26 pass these advantages along directly to you. "It's been a runaway success and the advantages are clear"
The cost of spoilage and over/under pours can reduce your margins by 10-25%. And with bottles there is $2-3 per bottle in glass, label, cork, foil, case and shipping costs. With wine on tap you have a more efficient, high margin way of serving quality wines by-the-glass. Tap26 offers a broad portfolio of local, west coast and international wines and ciders. You can easily find a selection to match your event's focus, demographics and budget. We know, beer is king at most events. High margin and high volume. Got it. But did you know quality alternatives are key to maximizing profits. More than 25% of event goers don't drink beer and over half of these folks will walk right past an underwhelming wine offering. We get it. Inexpensive national wine brands write checks and donate product. But running wine concessions at events this way is a mess. Literally. Cheap wine, bottles and icy water everywhere and long lines are the status quo. Don't forget the risk of theft and liability of hundreds if not thousands of glass bottles on location. What to do ... Tap26 provides a modern turn-key solution that eliminates these problems and increases sales. We have wine and beer certified vans, trailers, mobile bars and jockey boxes of every shape and size to fit your event. Tap26 provides a memorable alternative to keg party pumps, tubs of ice with jockey boxes on folding tables, Pourbox beer trailers and beer truck rentals for your event. We roll up with delicious wines on tap, eliminate the lines and waste, increase sales and roll out. It really is that easy. We're all looking for those little things that will create a memorable experience. So don't miss this opportunity to set your special event apart with a wine bar. Looking for something really special. We love the vintage mobile bars at The Cozy Caravan Club www.cozycaravanclub.com and the Prosecco Van & Craft Beer Truck at www.bubblesbrewbar.com. All of your guests will interact with the bar and it's servers. So make that interaction something to remember. Make it your own. The fact wine on tap is the #1 trend in wine, it's a green choice, it's faster to serve ... or maybe the fact it looks so fantastic hits the mark. Contact: Tap26 for more information. If you are outside of this service area and want to know more about our draft wine portfolio please contact us. We know your looking ... it's ok. We're passionate about finding delicious wine at a great value and we want to help you get into this business efficiently and profitably. So we are building a network of Tap26 approved wholesalers. We make it really easy for you to focus on selling and get you into this market with wines that sell in record time. Think about it as a way to immediately establish yourself as 'the' wine on tap experts in your market.